Following a nationwide backlash against the proposed hike in probate court fees, we are delighted to report, the proposal has now been shelved as the government state there will not be enough time, before the general election in June, for the proposed increase to be implemented. Following the election, the government will have to decide whether or not to push ahead with the changes, although it is hoped the any changes applied, will be on fairer basis. We will report any further changes as and when announced. 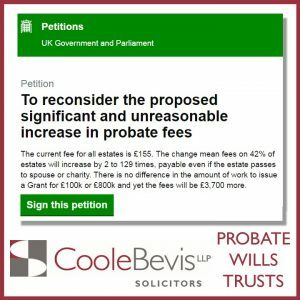 Many members of the public will be unaware the Government is proposing to significantly increase the fees for obtaining a Grant of Probate following the death of a loved one. Currently a flat fee of £155.00 is payable for the issuing of a Grant of Probate when a solicitor files the application. When solicitors file the application, the role of the Probate Registry is purely administrative, and the value of the estate has no bearing whatsoever on the nature of the work undertaken by the Probate Registry. However, despite the Government’s consultation on proposed fee increases having been overwhelmingly rejected, they still plan to impose the following new fees. These fees would be payable in order to obtain the Grant of Probate necessary to administer an estate, but in many cases there may not be sufficient liquid assets to cover the cost of fees, as many families’ wealth is represented by the value of their property. These proposed increases could therefore cause considerable financial difficulties for families following the death of a loved one. There are also risks that families will seek to reorganise their affairs to avoid the need to obtain probate, putting themselves at risk, and potentially leaving themselves with insufficient assets for the remainder of their lives. Many professional organisations such as Solicitors for the Elderly, sfe@standagency.com a renowned organisation of which many of our private client solicitors are members are lobbying the Government urging them to reconsider, and there is also a gathering momentum on a Parliamentary petition asking for the proposals to be reconsidered. If you have been affected by any of the issues referred to in this article, please contact Jenny Murphy, head of Private Client, Coole Bevis LLP for a chat on 01403 224627. or by email jenny.murphy@coolebevisllp.com.